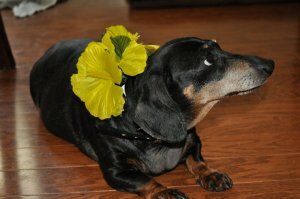 Consider Ladybug a sassy little girl, about 8 years young. She is an excellent and steadfast companion. Ladybug's dream home would be with a quiet single person or couple who lives a calm life. She would do just fine as an only dog, too -- all the more attention for her, she says! Her previous owner suffered a stroke and became unable to care for her. Ladybug's future was uncertain, but luckily DREAM had some space and wanted to give Ladybug her chance at a great life. She is looking forward to the time that she has a home she can call her own again, and she hopes that she never has to say goodbye to that family for the rest of her life. 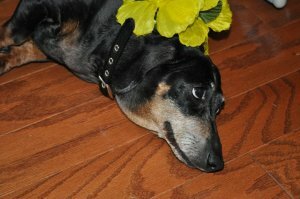 Ladybug does have Cushing's disease, which affects her adrenal gland and is very common in dachshunds. She takes one small pill a day to control the symptoms and she is good to go. Ladybug lives with kids now, but to be honest, she would be happiest in a home with only older children who are not too loud or move around too much -- she needs her peace and quiet! Ladybug will go to her new home microchipped, spayed, up to date on vaccinations and heartworm tested. (She's had a dental, too!) If you are interested in adopting Ladybug, you can fill out an application right at our website! Go to www.dreamrescue.org/Adopt. Then click on Our Online Application. Ladybug's adoption fee is $200. 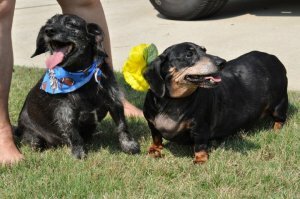 (All adoption fees go directly to veterinary care for DREAM dachshunds, and most dogs' veterinary expenses are much greater than our adoption fees.